Allcargo Greens continue to grow outdoors with its second initiative towards plastic free India and organised a Juhu beach clean-up on 1st of September 2018. Taking forward Allcargo Green’s initiative of plastic free India, on 1st of September, 18 of our colleagues from Allcargo assembled at Juhu beach and embarked to take up the challenge to clean the popular beach of plastic. Supported by an NGO “Beach Warriors” and the BMC we started at 11:00 am geared with gloves and cleaning tools we toiled, ultimately cleansing a small patch of about 2000 sq. ft. filling up approx. 30 bags of trash and waste. Almost 95% trash collected was plastic, which was extremely challenging to dig as they were filled and compacted with sand. 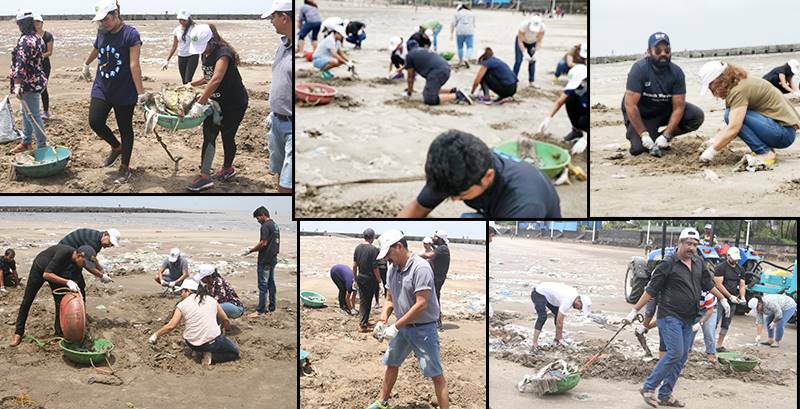 Our intention was to simply initiate a beach clean-up activity, however we learnt a deeper connect with how our day-to-day consumables like milk, salt, wheat flour plastic bags, wafers wrappers etc., have an impact on our environment. It was a motivating experience and raised an alarm within each one of us to stop using plastics bags in any form. As happy and content we may feel with this small achievement, it saddens to see how we exploit and take our surroundings for granted. If each one of us can stop this punishing act, and pledge to join such initiatives we could make a huge difference. Congratulations to the participants for being a part of Allcargo Green’s – Juhu Beach Clean-up.